Your professionally themed corporate marquee will leave a lasting impression on your business guests. Table linen to complement your business brand colours. Logo or signage banners placed at focal points. Dramatic lining and drapes co-ordinated in the colours of your company . Lighting effects that set the scene or add a splash of colour to your event. Flower displays and centre pieces to complement your event. For more ideas on your theme and our hire prices Get Your Quote. 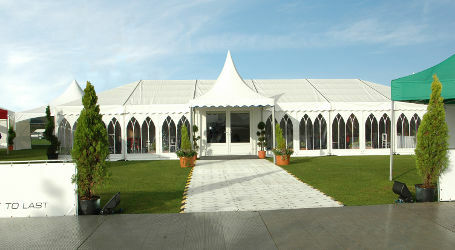 Unlike traditional business venues your corporate marquee provides an adaptable layout. Easy access entrance and exit points. Ability to exhibit large products. Conveniently located catering areas either adjoined or separated. Washrooms can be placed in ideal areas to avoid disturbing presentations. Use the advantage of natural light by placing corporate marquee windows at key focal points. For help designing your event layout download our marquee planner. If you would like us to help choose your event layout contact our team to Get Your Quote and arrange your site survey. Use your choice of event caterers as opposed to specific venue approved. No unnecessary expensive corkage charges. Select your own wine and champagne rather than compulsory venue drink lists. No additional venue fees if your event runs later than expected. For more practical advice on how to reduce your costs contact our team with Your Quote Requirements. Provide ease of access to forklifts and large vans to deliver your event materials and displays. Internet relays for live transmission and event purposes. National Television Satellite transmission vehicles. Conform to British standards for high winds and rainfall. Utilises all floor space and have no internal pole restrictions. Can be used whatever the time of year. Use your own company premises to host your event. Your grounds allow you to showcase your company and reduce ground hire costs. Your company building can host an Indoor structure to transform your interior space. Get Your Quote for more information on prices for your event. Events Officer, Coventry University, Coventry, West Midlands.